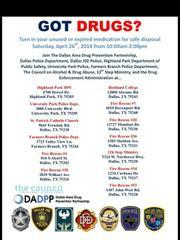 Prescription Drug Take Back is April 26, 2014. Turn in your unused or expired medication for safe disposal. See the photo for drop off locations.